Can we discuss what a bummer it is to feel anxious about buying a bridal gown or plus size dresses? Weddings are meant to be a fun celebration of love, and every time I’ve been told someone wants me in their wedding my immediate thought is “oh gosh, they don’t know how difficult buying a plus size dress is”. I get a knot in my stomach thinking that I’m going to be the odd man out, everyone else in cute matching dresses and me in an almost match. I was so excited when I found Azazie. I imagined what my wedding would have been like with a wedding party in gowns that fit their style, and a color that matched my wedding theme. I thought about how cool it would be to be able to offer everyone an option that they would love, that would fit them beautifully. 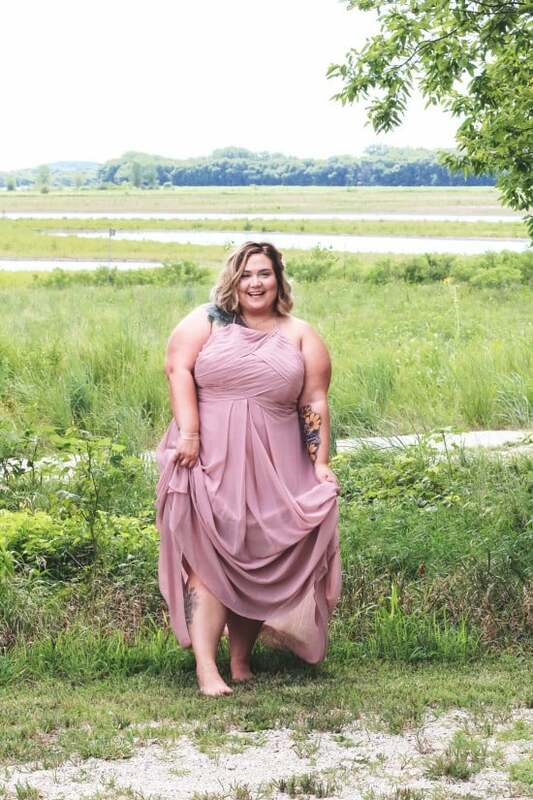 Azazie does that for you, and dang it we all deserve that!I have written about their gowns in a previous post about where to shop for plus size brides, and now I get to show you what their beautiful options look like on a plus size body! The dress above is my favorite that I got to try. It’s the Ginger style in dusty rose, and I’m wearing a size 26 (as usual). The ordering process is so easy, and I was so happy that their size guide was true to my normal measurements. I received 6 dresses in the mail to check out, all of them bridesmaid styles. Azazie offers a try-before-you-buy service that allows you to check out bridesmaid dresses for $10 a dress, or $25 for a bridal gown. After you find the dress you love, you can have it customized for free! All of the dresses I tried on were beautifully constructed and surprisingly comfortable. There were pleats in just the right places, and the boning in the bodices never poked me or dug into my back fat. 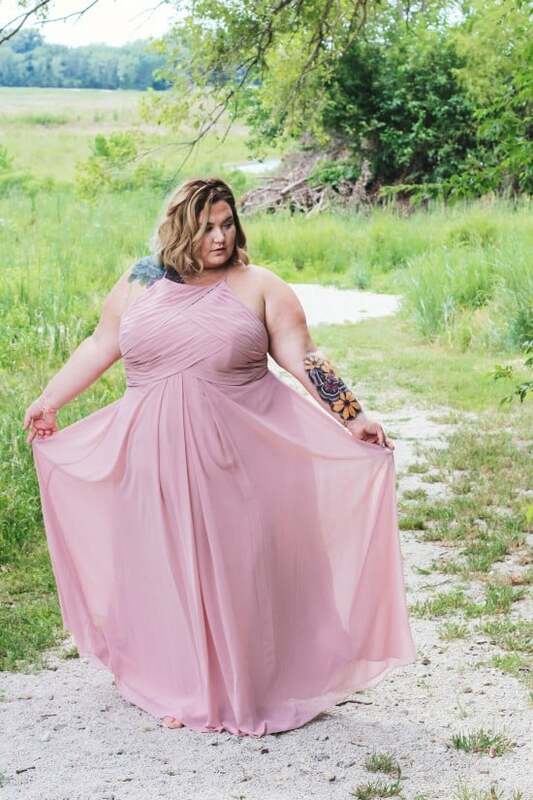 So many plus size gowns feel ill-fitting and cumbersome, Azazie manages to make plus size gowns that feel well constructed but still allow you to move and be a twirling princess! You can check out all of the gowns I got to try on in the video below! Big thanks to Azazie.com for providing all the dresses, and for working to make everyone’s special day just a little bit easier. Thank you!!! You saved my life. Already ordered mine this morning and I hope to look beautiful for my much younger brothers wedding!! I’m sad he’s getting married before me so I am just going to make sure I look beautiful that day, too! Jaja. Love you thank you!!! You saved the best for last (well they’re all beautiful). This post is perfect. 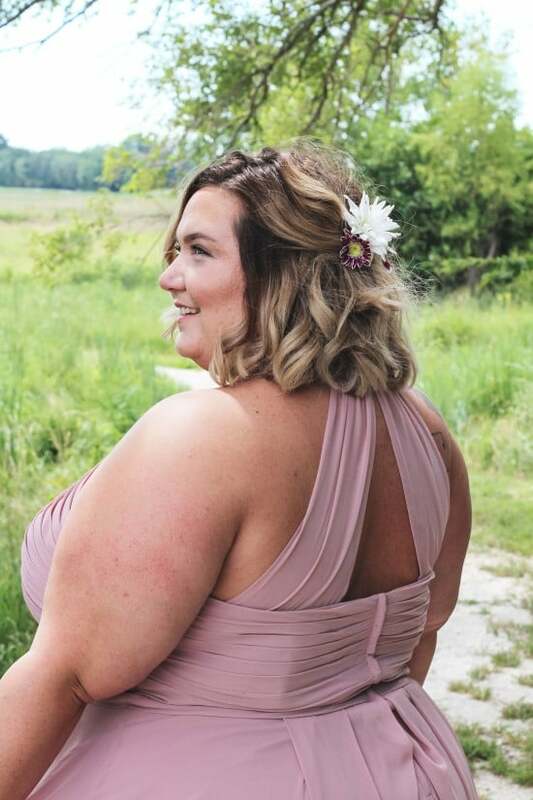 I’ve been a bridesmaid 3 times as a plus size woman and every time I cried becasue I was nervous about what I’d look like. Which is NOT what a wedding should make you do!! It’s great to know there are companies out there intent on making all women feel great as they support the ones they love. You look stunning by the way ? You look gorgeous lovely lady! good for you corrisa; you do look so elegant and beautiful.. Loving you as you and realizing that you had nothing to do with how you look and who you are… is the first step to total happiness and acceptance. Today on kickin wit Jenn10, our challenge is to post on 3 blogs what we think about it. I choose Fatgirlflow because I was interested in the perspective of a plus size woman. All my life I too struggle with finding clothes that fit. The problem I run into is that my top half or burst part of my body I would consider plus size but my bottom half is more avg size. 11-13. So I always have a hard time finding a dress that complients both aspects. Reading this article, has helped me to realize that im not the only female who has a problem with finding the right dress. 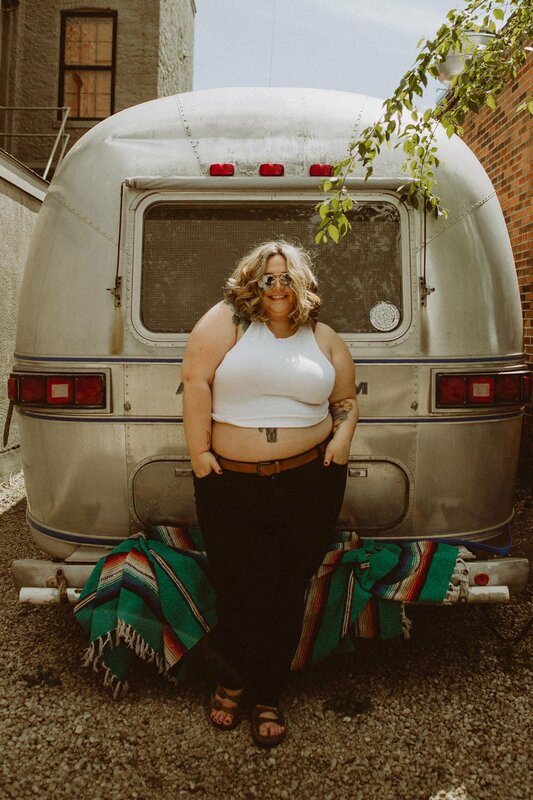 Thanks FatGirlFlow for this fantastic article. I just want to say that I think that color is wonderful on you. And I want to ask if that is a tattoo on your arm? The colors are amazing! You look beautiful. This was so helpful and awesome! I really enjoyed your blog post. You look amazing in your pictures too. The title of your blog is so adorable! I’m a new subscriber today! You really looked very nice in the pink formal dress. JUST LOOK AT YOU YOU PRECIOUS ANGEL!